The one with no links sold is because I submitted a php forum which doesn’t support TLA. Otherwise, almost every blogs have sold the links and two of them have been fully taken. 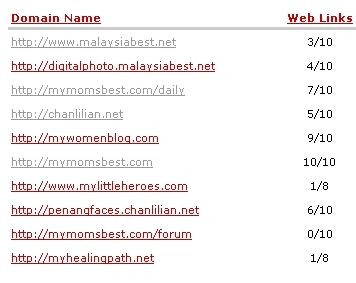 I am allowed only 10 links on each blog. The reasons my ads slots are sold? 4) I picked the right categories. Remember to log in to your TLA panel and see that your blogs are categorised correctly. So, want to make money? Sign up with Text Link Ads now. (referral link provided) Blogspot bloggers welcome too. BTW, I am having some WP error with [tag]TextLinkAds[/tag] new plugin. Grr….just can’t solve it. Anyone has any idea? I still have no luck on selling textlinkads on my blog. Any tips how to write convincing desc about my blog? hahah..